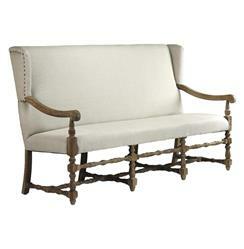 They say the devil is in the details, but this natural linen dining bench sofa begs to differ. The divine is what you'll find when you look closely: nail head details on the wingbacks, turned wood legs and framing and precise upholstery. Whether placed within a living room or dining room setting, the style and craftsmanship of this beauty make for a heavenly effect.